In October 2013, Arup Canada, in collaboration with Danish firm Dissing+Weitling and Montreal firm Provencher Roy, were mandated to develop the shape and geometry for the new bridge’s essential architectural components. Arup is the creative force at the heart of many of the world’s most prominent projects in the built environment and across industry. Its engineers and consultants deliver innovative projects across the world. The firm was founded in 1946 with an enduring set of values that fosters a distinctive culture, intellectual independence and collaborative approach. The people at Arup are driven to find a better way to deliver better solutions for their clients. 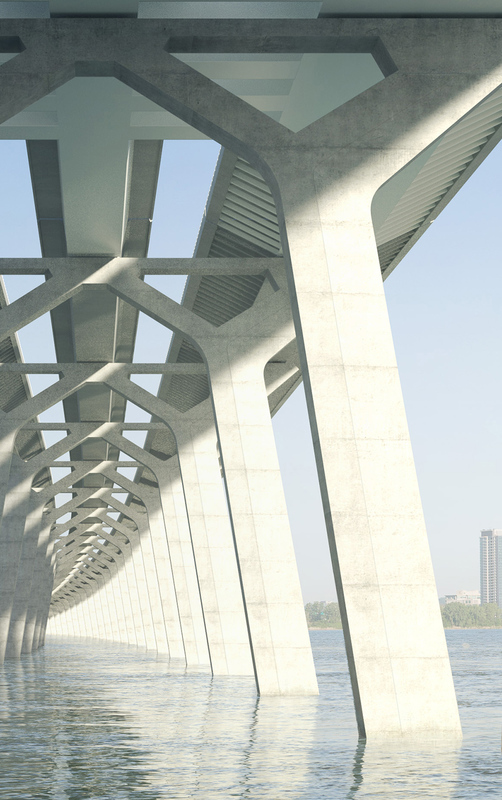 Danish architect Poul Ove Jensen, the head of Dissing+Weitling’s bridge department, has been appointed as consultant for the new Champlain Bridge project. Over the course of his career, Poul Ove Jensen has been responsible for designing and engineering some 200 bridges in about 30 countries. Montreal-based Provencher Roy is a multidisciplinary firm that provides services in architecture, architectural programming, urban design and urban planning. For over 30 years, the group’s innovative approach has considered the impact of its architectural proposals in time and space, favouring concepts that are an integral part of urban landscapes.